BubbleTree creates and manufactures the modular receptive spaces conceived by the French designer Pierre Stéphane Dumas. Our Bubbles are made to form customized event venues and offer to the guests an unparalleled feeling of comfort and well-being. Thanks to the principle of transparency, these ventilated structures open spectacular views from both inside and outside. Infinite combinations are possible with different designs and sizes of the modules, and the customized BubbleTree Event configurations are adapted to your plan: you can implement your most creative ideas to answer the requirements of your client. BubbleTree can devise and manufacture special modules adapted to your project. The simplicity underlying our concept allows us to come up with a unique solution for each project. We adapt configurations to match the requirements of the client, aspiring to stay ingenious and competitive. The BubbleTree Event team offers you the expertise and savoir-faire acquired through accomplishing professional event projects on four continents. We provide our partners – event agencies – with a personalized access to the 3D configuration application on our website. You can create online your own plan and share your proposal with your client. 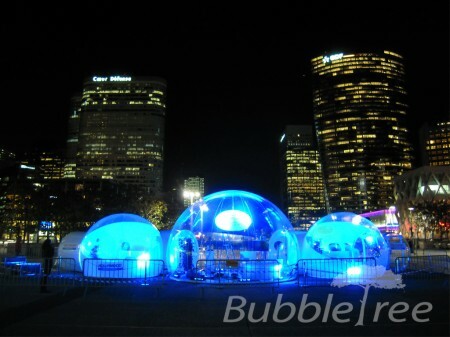 Contact BubbleTree to accomplish your event project.